Luno is a Mexican boy who just passed away. Now, he has arrived to "Mictlan", the land of the dead and he must help "Catalina" to defend this earth from the evil that approaches. 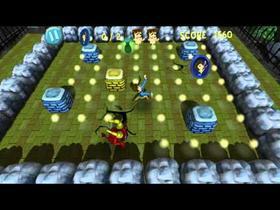 Mictlan is a wall defense game for the mobile devices, you control Luno and with the help of various items you must stop the monsters that appears from other dimension. Use the bone to hit them, a bread to slow them down or even summon Catalina and destroy everything that gets on her way. You can play the Story Mode and defend various landmarks of the Mexican land of the dead, or jump to the Arena Mode and kill the enemies until they get tired of trying to invade your new home.